I decided this year to utilise some of the many books we have and use famous – or should-be-famous – women from history as our educational starting points. A friend gave me a guidebook for a mothers and daughters circle called The Heroine’s Club a few years ago, and I’ve decided to use that as the foundation for our studies. Our first woman from history is Amelia Earhart, the first woman to cross the Atlantic. Amelia took her first flight in an airoplane at 23 years old. She started lessons 5 days later. Amelia was the 16th woman in the US to be issued a pilot’s licence. She gained her pilots licence less than a year later. Involved in creating the first commercial airline in the world. 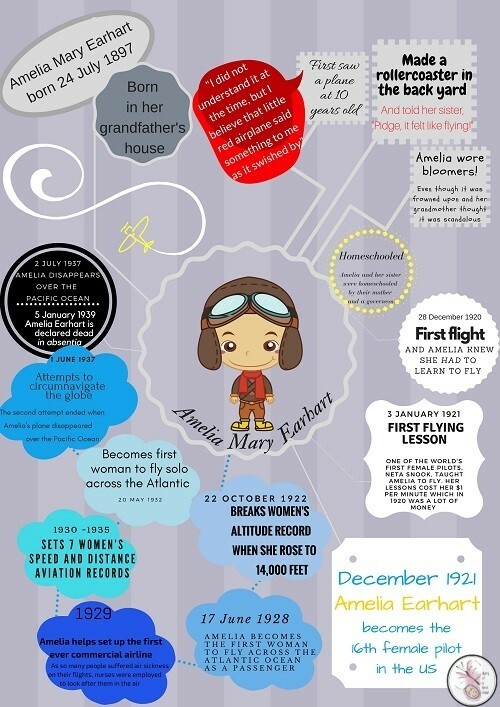 Amelia set 7 women’s speed and distance aviation records, including a world altitude record. Amelia also created a functional sporty fashion line. 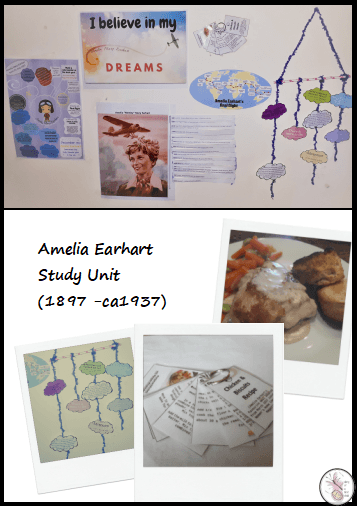 Over the last few weeks I’ve been so immersed in the story of Amelia Earhart that I thought I’d share some of the ‘less important’ things about Amelia that make her such a fantastic person to learn about, and to pose as a role model. Amelia was a ‘normal’ person. She came from a very middle of the road family, if anything, her dad wasn’t a particularly successful lawyer, and they moved around a fair bit. She was born in her grandfather’s house, homebirth being something my girls can relate to, and she was homeschooled until 12 – another thing that makes her relateable to my children. Amelia didn’t grow up with the things that became her passion. In fact, she first saw a plane when she was 10 years old, and after having been at a fair, she went home and made a rollercoaster from her shed roof. She coasted the box into the ground, breaking it, tearing her dress, skinning her knees, and she was exhilarated! Amelia went to high school, but she didn’t like it much. She started various courses, studied bits of different things, but nothing really stuck for her. She worked as a nurses assistant during the First World War and picked up a nasty sinusitis which plagued her and caused her to need surgery for years. When she started flying it bothered her, but not so much that she gave up. After her first flight – I can’t find where I read this, but I read somewhere that Amelia worked 3 jobs to save up the money for her first flying lessons. It didn’t come easily to her! She worked for it! Amelia had a sense of defiance for the status quo – she wore bloomers at a time where that wasn’t acceptable. Even her grandmother wasn’t happy about it, but she felt it was more functional than flying in a dress. Amelia was involved in starting the first commercial airline – by which I mean she helped set it up. She helped hire nurses to act as air hostesses because people kept getting air sick on the planes. She started a clothing line based on what worked for her. She didn’t want to get married, because she couldn’t accept having to give up flying to be a wife and mother (as Neta Snook, the woman who taught Amelia to fly, and many other women at the time, did). She eventually did marry, but she married someone who would see her as an equal and who would support her dreams, not stand in the way of them. 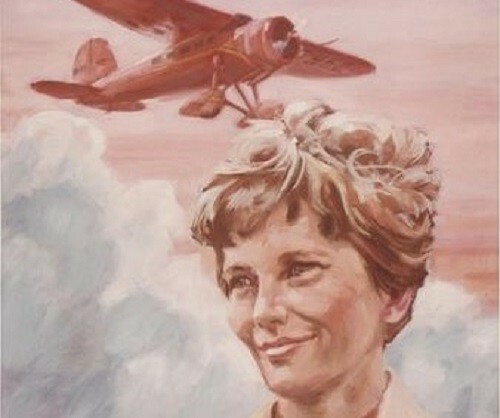 She also inadvertently blazed a path for women, and for women pilots. She was the first president of the Ninety Nines, an organisation for women pilots that is still in operation today. There is so much about Amelia that is relatable. She worked hard for what she had. It didn’t all come easily. She had to go against the ‘norm’. She had to make sacrifices. She broke records upon records, and she eventually gave her life for it. She believed in her dreams, and in herself, and that, I believe, makes her a woman who did. There’s a fantastic collection of colouring pages and activities on the NASA website. You can find the NASA Activity Booklet here. 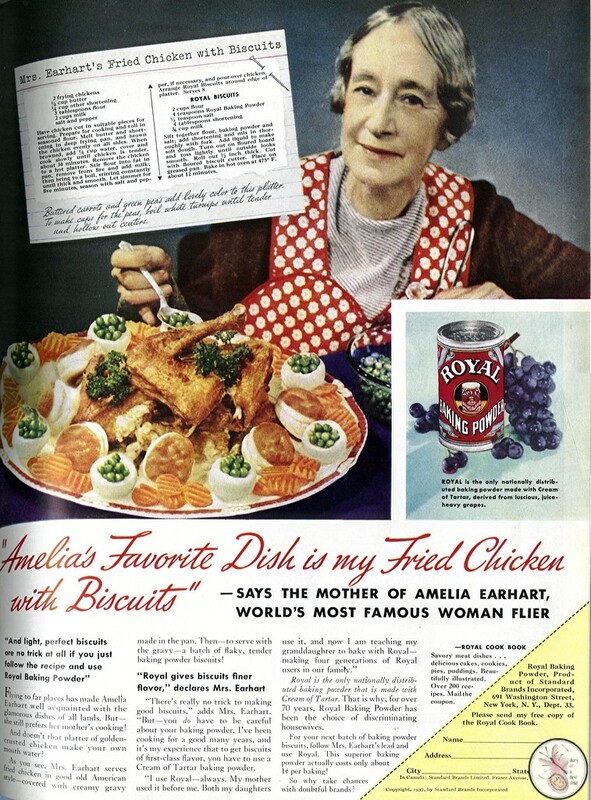 I found this old page from a magazine on Flickr, with a recipe for Amelia Earhart’s favourite food, apparently. Download a printable copy here but there’s an ‘adapted for kids cooking’ version in our study unit. We have the fantastic Goodnight Stories for Rebel Girls, which is a great introduction to many women, but they’re only one page each, so wanting a more indepth story, we also bought Who is Amelia Earheart? which offers simple illustrations, easy reading, but with enough information to really make our heroine come alive. Design clothes that you can comfortably wear while doing the things you love.